At Lynton house B&B Llandudno we pride ourselves in offering a 'home away from home' - the reason many of our guests return year after year! Our guest house is warm, friendly, spotless, comfortable, great value and we have a superb breakfast - take a look at our great reviews which we are very proud of. Location, location, location!! 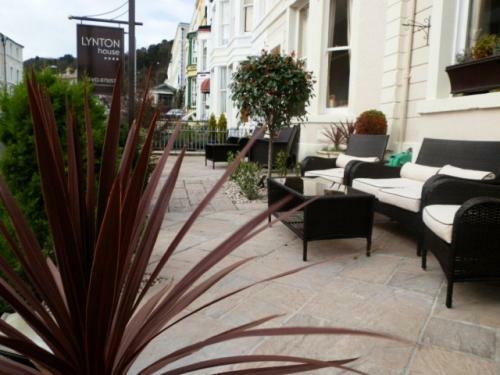 Lynton House is superbly situated in Llandudno beneath the Great Orme just 100 metres from the pier, promenade, seafront and the town's fantastic shops and restaurants. Within 350 metres you will find the famous cable cars and tram station which, will take you to the top of the Orme offering fantastic views of our stunning town. spruced, polished &tweaked we have finally finished decorating all the bedrooms and public areas. All of our en suite bedrooms are modern, comfortable and finished to a high standard with a few 'added' little extras that will make you feel more at home ie flat screen tv, ipod docking station and wifi. On a summers day you can take a drink onto our patio and watch the world go by!! "Excellent bed and breakfast, close to all amenities, rooms are finished to a very high standard, a truly wonderful place to relax in!" "Wonderful to be back.Best breakfastfor miles.Enjoyed our stay.Thanks M and S.Keep up the hard work in making Lynton House deservedly the number one B and B in llandudno"
'One of the best in the house' this spacious room has a lovely seating area in the bay where you can catch a view of the sea and people watch. Super king bed, beautiful furniture, 32" flat screen tv, what more could you ask for!! Modern Kingsize room with beautiful mango wood furniture , smart tv and a refurbished ensuite.